Calico — You went away just like you appeared, out of no where, you walked into my life. Calico cat you are so gentle, warm not taking sides, no separation, you were just who you were and never apologetic, you knew what you wanted , you knew who needed that love touch, walking through my front door of my home. Thank you Calico cat. As I lay your lifeless sweet body to rest you will always be in my heart for love sits on top of darkness and death. Your unconditional love was everywhere, my heart was ripe for your love to enter that day. You brought softness in the way I want to speak (soft with myself) and when confronted by others of different colors like a calico cat, to also be soft. You displayed all of your colors well, black white with maize in gods’ diversity. Loving, allowing yourself to be held in your last breathing moments cradled in my arms rocking ourselves in our rocking chair together, you were showing me to embrace life and death as we joined together in our sacred space, But death does not steal love. You are now cold and this mystery is: you still live warmly in my heart, you walked in to me and walked out. I am grateful for that walk my way. Love moves without an agenda. It just moves because that is its nature- to move. What you left I get it, it is all about life’ teaching, I get the big picture, your cats persistence taught me to receive love and healing no matter what form it comes in. Although your form is gone, placing you underneath my newly planted Bartlett pear tree, Mother Earth welcomes you, with help in growing her pears for our enjoyment .You have returned to where you came , thanks for making my home one of your stopping off places. I am so sorry for your loss. 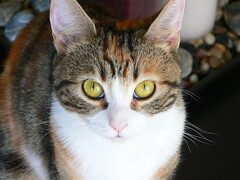 Calico cat sounds like she was a loving companion. I, too, am in the midst of saying goodbye to our dear oldest cat. Though he does not seem ready to leave us yet, I know we are walking that path. I treasure each moment with him & hope I can help him cross over as gently and as peacefully as you did with Calico cat. Peace, light & healing. I do feel your warm heart– your cats love will never leave you, Love has no opposites. Calico sounded like an amazing, loving cat. A loving relationship with a pet can be so special and bring such feelings of warmth and comfort. I myself, with the loss of a dog named Pablo a few years back, has hit similar chords as the both of your pet losses did. Losing a pet is hard. But this is one of several perfect venues to talk about that loss. Thank you for reading about my darlin cat.